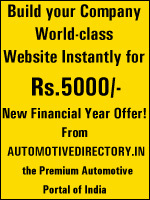 AutomotiveDirectory.in - Premium listed company will be positioned top on the related product / service category. This will tempt the browser to look your company Offerings./ services . On AutomotiveDirectory.in more than 20,000 companies are displayed , to mark your presence effectively on the customer mind, premium listing is the most effective tool. AutomotiveDirectory.in - the leading B2B automotive business portal on the planet is proud to offer two exclusive business building plans to expand your businesses globally with the power the internet marketing. We are proud to inform you that AutomotiveDirectory.in contains more than 20,000 web pages. AutomotiveDirectory.in is being promoted continuously through internet on various search engines like google, yahoo, Windows live, msn, aol, altavista etc., which results your products/services get high visibility. AutomotiveDirectory.in e-newsletters provide the perfect opportunity to significantly enhance your sales and marketing program. Whether you�re already participating in print, trade shows, direct mail, banner advertising, or more, e-newsletters give you the ability to reinforce and support any advertising or promotional effort taking place in any other medium.